It’s depressing, really, the past. Retrospection tends to clarify. Take the 1970s. Things were better. Things were worse. You don’t want a return to oppression, lawlessness, or the denial of rights. But you do want the frissons, frills, and highlights. You want the breaking of bounds, the challenging of conventions. You want a return to even a loose symbol of transgression. One of those 1977 Marquette University uniforms should do it — the edition in tablecloth white with blue piping that ran around the shoulders and neckline and, more spectacularly, around the shirt’s bottom. The players wore them untucked and, in doing so, caused a minor national stir on their way to an NCAA championship. The jerseys remain a point of excitement, accompanied by a tinge of exasperation. They’re like “Catch you on the flip side,” Bonnie Franklin, or Billy Dee Williams: emblems of an era that didn’t matter much beyond the moment they were in. Maybe you don’t want to relive 1977 — it was a tough year. But in Untucked, an ESPN 30 for 30 short by the actor Danny Pudi, the men who played basketball for Marquette in the latter part of the decade talk about the uniforms as a reaction against stuffiness and conservatism, as revolutionary, and you believe them. It seems true. It wasn’t just that the shirts weren’t stuffed into the shorts — it was that Maurice “Bo” Ellis arrived at Marquette in 1973 as a forward and was encouraged to do that rethinking. Al McGuire was coaching at the time, and he got Ellis into design classes and let the then-Warriors (they’re the Golden Eagles these days) wear the results. Ellis wanted patterns and colors. He wanted to introduce flourish and flair to a sartorially staid sport. This was a moment when the United States was experimenting with design and fabric and propriety. Men wore everything tight. Women wore pants. Everybody was hairy. People experimented with patterns — on other patterns. Not all the experiments worked. Fine, most didn’t.1 But McGuire allowed a bunch of black and white youth to be part of the national style conversation. All these years later, McGuire’s apparent casualness with the uniforms still inspires astonishment. Ellis introduced zigzags and arrowheads on the flank. There was the bumblebee getup — thin gold stripes on black — that was banned because referees claimed to find it difficult to see the players’ names and numbers. Fair enough. Even before Ellis’s innovations, the team’s cheerleaders leapt and kicked in uniforms with a chevron pattern on the miniskirt and a flesh-toned midsection, which created the illusion that the striped shirt was a long-sleeved halter top. (The knee-highs matched.) Ellis was joining a university guided, at least in part, by a spirit of playfulness. The first time an official must tell a player to tuck in the game jersey, the official shall issue a warning to the head coach. The next time any player on the same team has the game jersey untucked, that player shall leave the game until the next opportunity to substitute. The official shall enforce this rule at the next dead ball after observing the violation. As uptight as that sounds, so much has changed since 1977 that the rule hardly seems worth a fight. Untucked doesn’t work in basketball today. Even with the advent of fabrics that stretch with a player and wick moisture, men like their clothes long and loose. It’s true no fan wearing a jersey today is tucking it in. But that probably does more to reinforce the rule than relax it. Keep the line separating audience from performers discrete. Let the fans lack decorum. Also: There is no Bo Ellis today. There’s Adidas working in tandem with the NBA. There are too many considerations, too many people to please. But the primary reason not to demand an untucked option is corporeal. The sartorial advantage men had five decades ago was one women — certain woman, to be sure — continue to enjoy. Those men were lanky, and you can do a lot with lankiness. In 2014, there are just too many different bodies in basketball, and not enough of them are Chris Bosh’s. The great thing about those old Marquette jerseys is how they hung on the players. You get a charge out of how perfectly — how beautifully — they fit. Pudi’s movie doesn’t get into this (it runs 14 minutes), but those untucked uniforms were a marvel of tailoring. The jerseys had to retain the structural virtue of a shift dress without evoking dressness. You needed to see the shorts at all times. Ellis’s designs would be a disaster on the average player today. But setting regulations aside, I’d urge the apparel companies and their employers to reconsider. 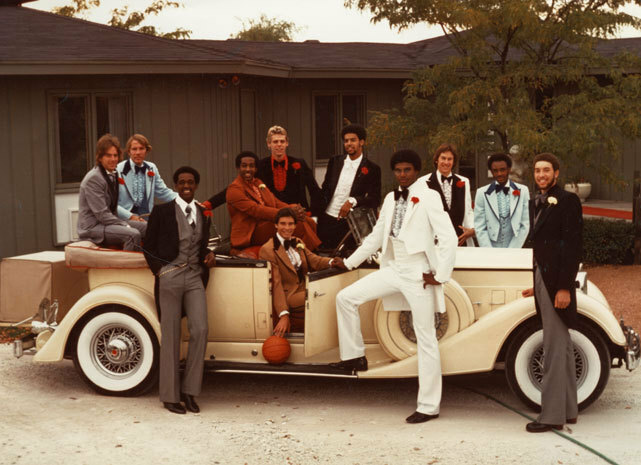 There’s a great, famous photo of the ’77 team arranged around a Rolls-Royce parked outside a ranch house. They’re all in tuxedoes, and only one of the tuxes is the standard black and white. You don’t want to go back to a time when that was normal.